Practice Polymer Engineering questions and answers for interviews, campus placements, online tests, aptitude tests, quizzes and competitive exams. This set of Polymer Engineering Multiple Choice Questions & Answers (MCQs) focuses on “Techniques of Polymerization-1”. 1. Which of the following initiation mechanism in vinyl polymerization, does not produce a pure polymer? Explanation: For uncatalyzed vinyl polymerization done thermally or photochemically, the polymer produced is very pure and free from any contaminants, while the use of initiator leaves the polymer impure due to the presence of traces of initiator in it. 2. What may be the consequence of the uncontrolled vinyl polymerization with excessive rise in temperature? Explanation: If reaction is left uncontrolled, excessive increase in the temperature at local points called ‘hotspots’ can cause discolouration, thermal degradation, branching of polymers and sometimes even cross-linking, giving rise to the formation of polymer of inferior quality. 3. Why does heat dissipation in bulk polymerization becomes progressively difficult with high conversions? Explanation: The stirring process and heat dissipation become progressively difficult due to gain in viscosity medium or due to solubilization or precipitation of polymer in the monomer, more so in higher conversions. 4. Which of the following monomer mixture is used in bulk polymerization? Explanation: Bulk polymerization is the polymerization of undiluted monomer and is the simplest technique of polymer synthesis. 5. How is the solvent in solution polymerization, more useful to overcome the disadvantages of bulk polymerization? Explanation: The solvent reduces the viscosity gain, thus allowing more efficient stirring of the medium and proper heat dissipation of the heat liberated. The chain transfer to solvent causes a problem for solution polymerization. 6. Which of the following is a demerit of solution polymerization? Explanation: The solution polymerization process often requires the handling of inflammable solvents and the recovery of solvent from the polymer to isolate it. Chain transfer to solvent may also pose a problem as the purity of polymer is affected due to the leftover traces of solvent in the polymer product. 7. Which of the following polymerization system prepared by solution polymerization, is heterogeneous in character? Explanation: In polymerization of acrylonitrile in water or any organic solvent, the solvent is not able to dissolve the polymer being formed and so the system becomes heterogeneour in nature with polymer formation. 8. Which of the following polymerization is also known as pearl polymerization? Explanation: At the end of the suspension polymerization, the polymer formed appears in the form of tiny beads or pearls, so it is also known as pearl polymerization. 9. What kind of initiators is used in the process of suspension polymerization? Explanation: In suspension polymerization, oil-soluble initiators like peroxides, hydroperoxides and azo-compounds are used. 10. Which of the following is used as a stabilizer in suspension polymerization? Explanation: The process of suspension polymerization requires water soluble polymer stabilizers like CMC, PVA or gelatin, etc. to raise medium viscosity and stabilize the suspension. 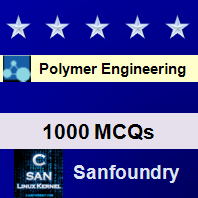 Sanfoundry Global Education & Learning Series – Polymer Engineering. To practice all areas of Polymer Engineering, here is complete set of 1000+ Multiple Choice Questions and Answers.